Dublin City Council is on the hunt for a contractor to carry out litter removal services for the city, and has spelled out exactly what the capital’s street cleaners should expect to encounter on a daily basis. So, if you’ve ever wondered what the contractual definition of ‘litter’ is, read on. Not to mention the usual sticks & stones, leaves, dead vegetation, soil, scrap metal, rope, wire, bottles, glass, household refuse, papers and mud. The contract will employ five workers to carry out cleaning duties in the North West of the city. The tender document spells out just how hazardous the job can be, specifying that the litter removers must be provided with appropriate protective clothing. Dublin city council also caution that they won’t be paying any extra for staff to work on public holidays, with the contractor expected to top up wages out of their own pocket. 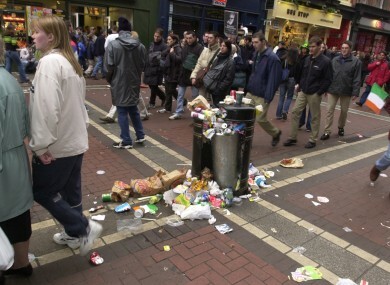 Email “Dirty old town: Here's what you have to clean up as a Dublin litter warden”. Feedback on “Dirty old town: Here's what you have to clean up as a Dublin litter warden”.